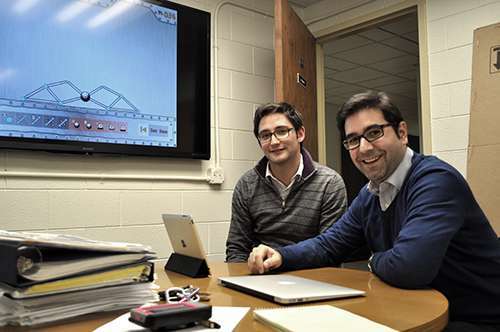 Truss Me!, an educational app developed by Aerospace Engineering faculty Julian Rimoli, is attracting a growing number of fans – from teenagers curious about what science can teach them to college educators curious about how to better teach science. Since its November debut in the iTunes store,Truss Me! has been picked up by more than 1,500 individuals in more than 40 countries. Some players are undoubtedly Rimoli's own students, who are using the game in their statics class this spring. But the vast majority stumbled across it on one of several educational websites—like UK EdChat, iMechanica and sourcable.net – where it is creating quite a buzz. "I got an email from a civil engineering professor at Purdue, saying his daughter in middle school started playing Truss Me! and loves it. She was actually explaining how she was selecting the length and cross section of the bars to avoid buckling in the moon lander challenge," Rimoli said. "And I got an email from John Laughter, a senior vice president at Delta, telling me he and his wife Angela wished they had this app when they were students at Georgia Tech." A recent piece of fan mail came from Chiara Daraio, a professor who wants to use Truss Me! to develop new curricular activities for mechanics of materials classes at ETH Zurich. Rimoli began consulting with Daraio in January, but it does not stop there. "Truss Me! is a great way to introduce foundational concepts to students at almost any age – high school, middle school, college," he said. "They don't have to waste time with a dumbed down version that looks pretty. The science in Truss Me! is the real deal." Truss Me! challenges players to draw on their imagination and skills to build the lightest possible "moon lander vehicle." In the "freestyle" mode, players explore different concepts and tinker with different designs, always trying to beat the computer's weight. A ticker at the top right-hand side of the screen records the weight of each design. In the "challenge" mode, players must overcome a series of 15 different challenges, each representing a real-world structural variance. Each level that the player "wins" gets him closer to attaining a "golden nut," the ultimate prize. The soundness of the player's design is tested with a simulated lunar touchdown. This is where Truss Me! 's adherence to scientific principles makes it stand out in the crowded field of educational apps. The cartoon image that players see on the Truss Me! screen represents the actual behavior of a structure in real-time. For instance, if the bars supporting key components are not substantial enough, the moon lander will succumb to compressive instability or buckling. Players watch their vehicle crumble. "These are the same fundamental numeric and mechanic principles - geometric and material nonlinearities, plasticity, buckling - that we are teaching in class, but I learned a lot from designing the challenges and testing them," Rimoli said. "What I want students to do is to gain a more intuitive grasp of the material by simulating the truss behavior in different scenarios." Rimoli's approach merits serious attention, says College of Engineering's Director of Educational Research and Innovation Wendy Newstetter. "Truss Me! is a lot like Angry Birds, another popular mobile app, in that both games base their action on actual physics principles. The consequences are not randomly assigned," she said. "What brings Truss Me! closer to being an educational tool is that the players experience failure and get a chance to keep playing, to make changes to their structures. Without failure, they are just witnessing those principles. This challenges them to go a little further." Newstetter said the addition of a new "questioning" section would put Truss Me! more squarely in the realm of mainstream educational apps. "A section that would encourage players to reflect on the possible reasons for each failure, to identify specific causes," she explained. "But even without that component, this is a very exciting development – something that very hard-line traditional engineering faculty are paying attention to." For his part, Rimoli, who recently received the Lockheed Dean's Award for Excellence in Teaching, says he is open to tinkering with the app to improve its value. "I developed this app as a hobby, in my free time, over the course of about four months, and I wanted to use it to supplement lectures in my statics classes. But I have come to see that it can also help students to absorb concepts, intuitively, as they observe simulations on their own, while they are playing it. I like that I could use my research skills to build an app that simulates real-time truss behavior on a tablet, but more than that, I like that this enables students to have fun while learning."